Hearing loss is often overlooked, undiagnosed, and undertreated, despite being the third most common medical condition in the United States. In part, this may be due to the fact that it is an invisible condition, and many of us do not pay attention to our sense of hearing until there are significant changes. After all, our hearing is always “on,” even when we are asleep. Even with gradual changes, many people with hearing loss will accommodate their changing hearing abilities by turning up the volume or asking people to repeat themselves in conversation. It is estimated that people wait an average of seven years before seeking treatment for hearing loss. In this time, untreated hearing loss can take a toll on many different aspects of a person’s life. Fortunately, there is an easy solution to curb the negative aspects of untreated hearing loss. With a simple hearing test, you’ll learn about your hearing abilities. If a hearing loss is detected, then our team at Beverly Hills Hearing Center will work with you to find the best solution. Treating hearing loss with hearing aids brings significant benefits to your health and well-being. Here are just some of the benefits that you’ll experience by treating hearing loss. With untreated hearing loss, communication becomes difficult, and this could impact your productivity in the workplace as well as your ability to work efficiently with your colleagues. Treating hearing loss, regardless of the degree, brings a fiscal benefit to your financial situation. Studies have found that people with untreated hearing loss experience depression, anxiety, and stress at increased rates. Furthermore, untreated hearing loss often leads to social withdrawal due to difficulties with communication. Social isolation, especially among older adults, is a leading risk factor for developing dementia. Overall, we all know that healthy communication is important to our relationships, from our spouses and partners to our children to our friends to our neighbors and beyond. 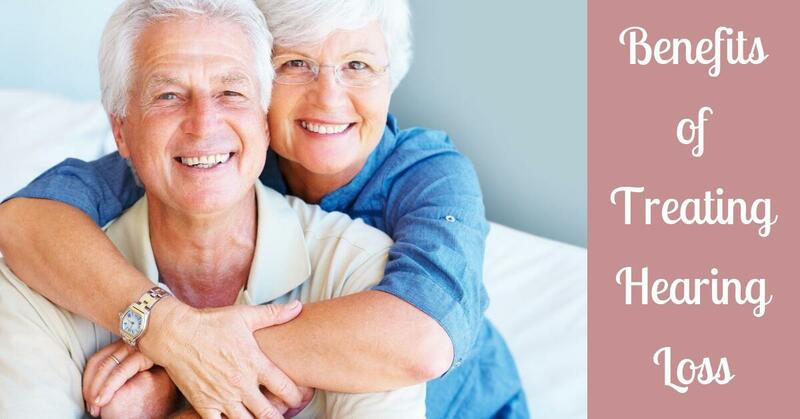 Treating hearing loss with the use of hearing aids improves your speech recognition abilities, which makes it easier for you to interact with your loved ones. Staying connected with loved ones is an important part of your overall socio-emotional well-being. There have been many studies investigating the correlation between untreated hearing loss and an improved risk for dementia. In part, this is due to social isolation as a risk factor for dementia. Studies from Johns Hopkins have also found that one’s cognitive load is greater with untreated hearing loss, as your brain tries to make sense of sound. This increased cognitive load could tire out the brain and use resources that would otherwise be used for other functions. A study from Japan found that the use of hearing aids does improve one’s cognitive abilities. Furthermore, by treating hearing loss, you are reducing risk to your physical safety. People with untreated hearing loss have an increased risk of falls and accidents, and new studies have shown that people with untreated hearing loss have a greater number of return visits to the hospital compared to people with normal hearing. Studies from Finland have shown that treating hearing loss with the use of hearing aids opens up your “life space,” meaning that you will be more confident in moving about and being active in your life. With the use of hearing aids, people experience greater security, confidence, and independence compared to people with untreated hearing loss. Because hearing plays such an important role in our everyday life, it is clear that treating hearing loss brings significant benefits to many areas of our life. From improved performance in the workplace to higher earning power to increased safety and security to reducing the risk for long-term chronic diseases, the benefits are manifold. If you are concerned about your hearing abilities, visit us at Beverly Hills Hearing Center today for a hearing test.